When we first started dreaming about building, we spend many hours touring houses: the Parade of Homes, open houses and model homes. If it was anywhere near us, we were there. 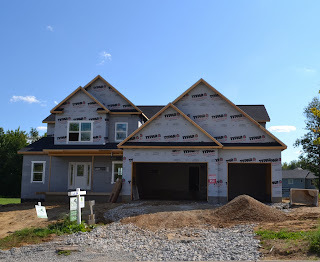 As we started to picture what kind of home we'd like to build, we started looking behind all the typical bells and whistles, upgrades and fancy finishes. We starting thinking about what elements would really make our house a dream. The American housing market is overrun with McMansions that aren't selling because home owners are now looking for quality over quantity, and efficiency over extravagance. Even if a buyer finds a big house bargain, can they afford the taxes and utilities of such a home??? Don't get us wrong, Niels and I both appreciate the nice things in life just as much as the next person, but for us, the question always comes down to practicality. Are we going to spend more on cork floors? Yes, because they are sound insulating, which decreases the frequency and/or severity of my headaches, which gives me a greater quality of life. Easy. Are we going to spend more for a high-end custom tile shower? Nope, because we can get just as clean in a fiberglass insert shower and don't have to worry about cleaning all that grout! When it came time to choose a builder, the structure of our new home was as important as the finished product. Anything can look high-end for a few months waiting for a sale. We wanted to know that the home we built would be a solid home for years to come. We actually walked into one model, maybe 6 months old, and there was already a HUGE crack along the ceiling. Didn't take long to cross them off our list. Realizing each house 'settles' we thought, if this is how they treat their models, what does the house without all the scrutiny look like? One of many reasons we chose Charis Homes is that they have "dusty shoe" open houses. It's an opportunity to see the bones of a building before all the sheet rocking goes up and it looks like any other house. It was at a Charis dusty shoe that I saw my first ICF form and finally understood why Niels was so adamant that we needed to use it for our home. We've been to maybe ten dusty shoes with Charis and we continue to be impressed with the quality of construction. We think it says a lot of a builder if they invite potential home owners to visit their work "behind the scenes." Of course, we also appreciate that we are welcome, as the home owner now, on the job site at any time. Our builder assures us that he rather hears about our concerns or mid-course changes sooner rather than later (since no matter how final you think your plans are, they really aren't. Some things can really only be seen in real life). So tomorrow, we get to pay it forward to any local potential home owners. We're have a dusty shoe open house for our new house, tomorrow, September 1. (If you're local, and want to check it out, send us an email and we'll give you the address). Nestled in the back of the quiet and kid friendly KR development in G..., this four bedroom, 3.5 bath home has ample adjacent green space and stunning sky views. The design of this house was a result of diligent home-owner research combined with Charis Homes’ expertise in energy efficiency. The two story, full ICF home has upper and lower master bedrooms, two additional bedrooms, a large dual-island kitchen designed for baking, entertaining and easy green living. The entire first floor was built with universal design principles including wide hallways, easy-to-use pulls and rockers, lowered baking center and kitchen drawers to make this house a forever home. Thoughtful consideration was given to practical living and ample storage with features like mudroom lockers, first (and second) floor laundry, and a generous 9’ x9’10” walk-in pantry. The beautiful 13′x28′ covered outdoor living space features fans and wheelchair access. HERS (Home Energy Rating) Score (est. ): 42, or 58% more efficient than standard home construction. Projected annual gas bill: $300.